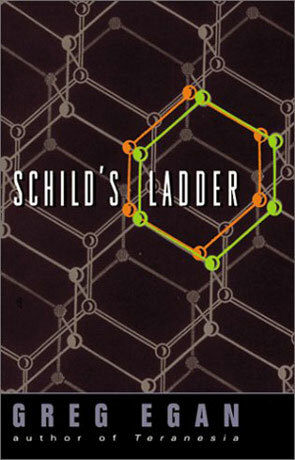 Schild's Ladder is a science fiction novel by the Australian author Greg Egan. Egans latest hard physics thriller Schilds Ladder, presents his yet hardest to understand story. This time I'm actually unsure whether it's worth the effort, to try to understand what he’s saying. I normally find great pleasure in Egans strange expeditions in to the world of physics. Part of the pleasure stems from the fact that I (most of the time) understand what Egan is saying or trying to visualise. The other part is of course that Egan normally spins a very tight and thrilling story. I tried hard but this time Egan managed to leave me truly dusted a couple of times. Or maybe it would be more honest to say "most of the time". That wasn't a nice experience. It's twenty thousand years in the future and the laws of nature has been doing just fine since Sarumpaet figured them out about 300 years in to our future. The scientist Cass has an idea for a series of experiments that will test the laws even deeper than before, not because she thinks them at fault, but to add an extra digit to our knowledge. Unfortunately the experiment triggers a chain reaction, which results in the creation of a vacuum bobble that expands at half the speed of light, converting everything thing in it's way to nothing, or at least not something that follows the normal laws of physics. In other words : she triggers the, infamous, process that unravels the space-time continuum. Soon we follow a ship full of scientists as they hover just above or maybe in front of the expanding bobble. The scientists are split in to fractions – one that want to stop the expansion of the bobble and then investigate it and one that just want to destroy it. That part is a bit uninteresting and Egan doesn’t really do much with it except create a bit of tension on the ship. What he does use a lot of time on in explaining the experiments that will take place on surface of the bobble and the results of them. It’s rather cool, that Egan manages to create not just one new set of rules for the universe, but a hole bunch of them. The not that great thing is that if you stumble somewhere along the way you’ll probably stay lost for the rest of the book. I didn’t “get it” fairly early in the book – I simply couldn’t visualise the things Egan was trying to explain about the Sarumpaet rules. Okay, I didn’t try to read it an extra time, and maybe I should, but, damn it, this is a piece of fiction! I did manage to enjoy most of the rest of the book, but still with the felling that I (and there for Egan) somehow failed. Written on 15th May 2002 by TC.